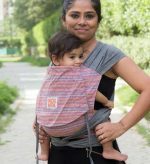 The Happy Baby Carrier is as beautiful as it is functional, and it is a minimalist's dream! Made from gorgeous linen fabrics, this simple carrier is easy to use from birth with no infant insert required. Perfect for summer wearing and for anyone who doesn't love the bulk of a traditional buckle carrier. 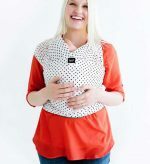 The Happy Baby Carrier is a beautiful and lightweight carrier that is a minimalist’s dream! 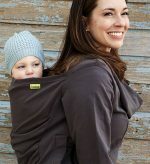 Made from gorgeous linen fabrics, this simple carrier is easy to use from birth to toddlerhood. Perfect for summer wearing and for anyone who doesn’t love the bulk of a traditional buckle carrier. Built with many of the components of a traditional buckle carrier, the Happy Baby has a wide webbing waist rather than a stiff waistbelt. The wide shoulder straps distribute baby’s weight across the wearer’s shoulders and back without adding bulk. We like to describe the Happy Baby Carrier as a cross between a meh dai and buckle carrier. The soft cloth body that molds to your baby’s back reminds us of the natural feel of the traditional meh dai, while the webbing and buckles offer the ease of use of a buckle carrier. We love how small and compact this carrier is when we aren’t wearing it – it’s easy to throw in your diaper bag when it’s not in use. Folds down compactly – great for the diaper bag! Suitable for wearers up to size 22. 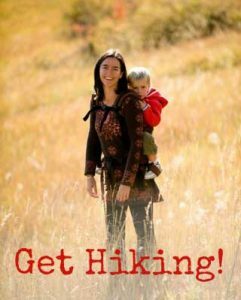 Looking for the Happy Baby Carrier that lets you face your baby forward? Check out the Happy Revolution carrier! Happy Baby released a second generation of the carrier, which was rolled out in the early part of 2018. The newer Happy Baby Carriers added features, including a cinching feature to make the base of the carrier narrower (if needed) and some additional padding at the leg holes. All of our current stock of Happy Baby Carrier are the newer version and include leg padding and the cinching feature. The Kol Kol Meh Dai is a versatile and comfortable meh dai carrier, with straps that tie and a natural, minimalist feel. Use from birth to toddlerhoodl, 7- 33 lbs. The Ergobaby Adapt is incredibly adjustable so that you can carry your infant without an insert! Can be worn on the front, hip or back. This is such a nice light weight carrier! The fabric is absolutely gorgeous and supportive yet very breathable on warm days! I love the waist belt and how it sets higher than other ssc carriers without all the bulky padding. Being a curvy g...al, this carrier has plenty of webbing on the arms,back and waist strap. We LOVE our Happy Baby carrier! Its minimalist design makes quick ups and downs a breeze. Its streamlined and AMAZINGLY comfortable without having a bulky waistband and the low frofule.staps make me feel like I'm not even using a carrier! T...he freedom of movement is beyond compair, and Baby is always happy. The only downside is that the only pocket, altho large, only holds the hood and when baby is in the carrier, isnt very useful for holding phone or keys. The Happy Baby has quickly turned into my “go to carrier!” It is absolutely gorgeous and travel friendly!! The light weight fabric is perfect for me in this 100+ weather too! 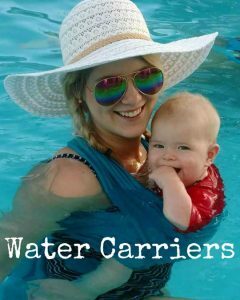 Just love this carrier! This is the perfect summer carrier. It's very lightweight and the fabric is super breathable. I no longer have to worry about my baby overheating while I'm wearing her. We both love this carrier! If you live in a hot climate and need a summ...er carrier, this is the one you should get! It’s my favorite baby carrier I own! It’s so comfortable for me and baby! Super soft material too! The BEST carrier I’ve ever had. 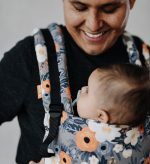 I’ve used many different slings, ergos, and lille baby carriers, and the happy baby is the easiest one to get on and off, is so light, and also supportive. My little girl LOVES it and I always get asked about... it when We are out and about. Shipping was super fast and the discount for entering your email was nice too! Well this is absolutely very light weight and beautiful carrier. I love the Marigold color. It’s been a week I got it and have used it just few times. My baby stays in it for only 15-20 mins and after that she become fussy. It’s our first s...sc carrier and I really love it wearing. But I m sad I am not able to wear for long for my baby. I notice the side straps adjustment buckle always hits n rub under my arms when I keep my hands down. I don’t know if it’s normal to feel. I am hoping this carrier can work out for my baby. It is absolutely gorgeous!!! It is not my first one, but for sure the best I have ever had. It has everything I need or appreciate - the incredible wearing comfort and sophisticated, elegant design:). It is also very good conceived - the de...signer must have a gerat experience with baby wearing. I would like to thank you a lot for your professional and very kind support. I very appreciate your help and cooperation with me during the purchase process! This product is very nice, the fabric is soft and buttery, I was able to get my hands on cider. The color is prefect. My little one loves this and sleepy dust is strong. I have yet to use it in the Texas summer heat but I'm hoping it's as b...reathable as others have stated. Mostly very Happy! I think this is a great option for petite women and for someone who really prefers a sling or wrap, but want the higher weight limit of a soft structured carrier. My baby really seems to like it and sleeps more comfortab...ly in it compared to the sling or capulana. She gets very excited when I pull it out. Both the front and back carries are very comfortable. It took a bit of getting used to to figure how to best adjust it for each carry, but the adjustable strap closure (slides up and down) is genius. It is still a bit of a bother to adjust between my husband and I compared to the wrap, but not so much that we would change our choice. It is strong enough to contain my strong and active 22 lb. 8 month old, and will give us more mileage than other carriers as she grows. We like that it is padded enough to be comfortable but sleek and low profile which is great for us in NYC. It has become our go to carrier. I can stuff it into a bag as easily as a sling. My only real issue is the ease of use of the hood/head support. It is a pain to get in and out of the very tight zipper pocket, and it is impossible to employ in the back carry without taking your baby off. Love my happy baby carrier! The customer service here is incredible as well. Very happy. Little one is 18 pounds and loves to be held, this has been a lifesaver for my back. I absolutely love this carrier. It folds up so incredibly small, which is great for the diaper bag. It is soft and comfy, and all of the colors are perfect!